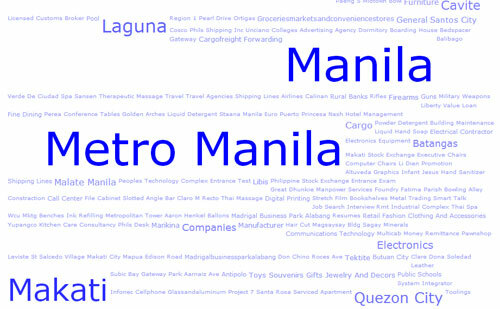 Take a fascinating look at what people are searching for in www.philippinecompanies.com by viewing a tag cloud of the latest 500 searches done in the website. Font size and color are adjusted to the popularity of the keyword. Some interesting insights can be derived by analyzing this relatively simple data representation.The majority of searches are targeted to Metro Manila. Indicative of how the Philippine economy is still heavily centralized around the capital. Interestingly, you’ll see how the other provinces and cities stack up as well against the capital (and its component cities against each other). i.e. Cavite, Batangas and Laguna are playing catch-up to the popularity of Metro Manila. The most common search topics entered include “Employment and Immigration“, “Construction Companies“, “Education/Schools“, “Hospitals“. This shows us the priorities of the Filipinos in terms of looking for work abroad, improving infrastructure/building houses, getting an education, and healthcare. It would be interesting to see how these trends change over time so check-back every now and then to Philippinecompanies.com’s Tag Cloud Page.